Today, I begin my series of posts dealing with the 5c value from this series. Unitrade's listings for this value until fairly recently were were lacklustre, and ignored many of the paper varieties that can be found on the dextrose gum sheet stamps, at the very least, and possibly some of the PVA gum sheet stamps. However, in recent years, they have added several listings so that they now list four levels of fluorescence for the untagged sheet stamps with dextrose gum, and two for the PVA gum stamps. However, there are many more attributes that show variation on this value, the chief among them being the shades of blue on which the stamp can be found. They run the full gamut, from very deep, dull blues all the way to deep bright blues. Yet, for some reason, they are completely ignored by Unitrade. In addition, there are the usual variations in perforation and gum that can be found also. This week, I will discuss the untagged sheet stamps in detail. The remainder of this post will start with the dextrose gum stamps, and will finish up with the PVA gum stamps. A cream coloured paper that appears off-white against a stark white background. This paper has a highly burnished, smooth surface, which appears to have a light surface coating, when the printing surface is examined under a 10x loupe. There are no stray fibres visible on the paper surface at all. On the back, a light horizontal ribbing can just be seen on the gum, and this becomes much more visible when the paper is held up to a strong back-light. As above, except on this paper, there is no ribbing visible on the gum, and the mesh is much more difficult to see - even when held up to a strong back-light. As (2) above, except that the mesh is quite strong when viewed against strong back-light. A whiter paper, though still off-white when viewed against a stark white background. This paper shows the same burnished surface as the others, and no visible ribbing on the back. When held up to strong back-light and viewed, vertical mesh is very clearly visible. as (4) above, except that light horizontal ribbing is visible on the gum, and the horizontal mesh is very clear when the stamp is held up to strong back lighting. A cream coloured paper that is similar to (2) above, except that no mesh is visible, even when viewed against a strong back-light. Paper types 1 and 2 seem to occur only on the dull fluorescent papers and low fluorescent papers, and it would seem that for each level of fluorescence, the paper is generally one type of the other, but not both. Paper type 3 seems to occur only on the non fluorescent paper. Types 4 and 5 are found only on the so-called hibrite papers, although I note that all the true hibrite papers that I examined, and the less bright high fluorescent papers were all type 3, while the medium fluorescent was type 4. Paper type 6 seems to occur only on the dull fluorescent paper. The dextrose gum printings of this stamp are listed as being on either non-fluorescent paper, dull fluorescent paper, low fluorescent paper and hibrite paper. The picture above shows the non-fluorescent paper at top left, the low fluorescent paper at the top right, followed by the dull fluorescent at lower right, and finally the hibrite paper at lower left. As we shall see, there are several sub-varieties of each of these four basic paper types, which will now be discussed in detail. There is a fine line between dull fluorescent and low fluorescent paper, and between dull fluorescent and non-fluorescent. Generally dull fluorescent papers contain a bit of white in the colour, or at least a light grey in the colour. In contrast, non-fluorescent papers do not appear to contain any white in the colour at all under UV, and low fluorescent papers appear brighter white under UV by comparison. The pictures taken below show ten different types of dull fluorescent paper that I have found on this value. It should be noted that some of these varieties are very, very close to one another. So, it is a matter of personal choice as to how many you think should be included in a specialized collection. The paper of the block on the left is an ivory-grey under the UV light. The paper contains very few high fluorescent and hibrite fibres. If you look near the upper right corner of the lower left stamp, just to the left of the shed on the lower right stamp, and in the upper selvage tab, you can just see a few of these fibres. The paper of the block on the right is greyish white under the UV lamp and contains very few low fluorescent and medium fluorescent fibres. These fibres are not generally visible without the use of a loupe, there are so few of them. 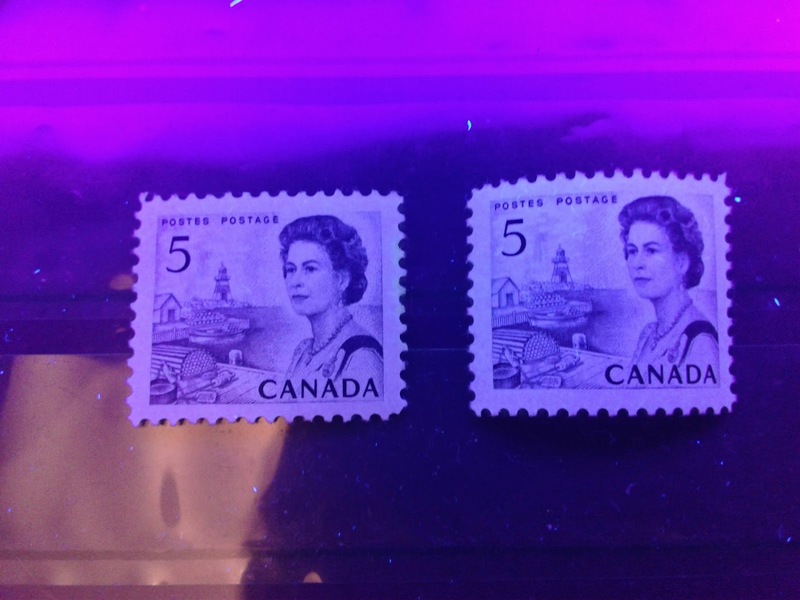 The two stamps on the left are on ivory coloured paper under UV. The stamp on the left has 1-2 low fluorescent fibres in the paper, while the second stamp from the left contains very few medium fluorescent fibres. Again, these fibres are not prominent, but are readily visible under a loupe. The paper of the block on the right is grey under UV, with very few medium fluorescent fibres. The stamp on the top left is bluish white under UV. It contains very few low, medium and high fluorescent fibres. 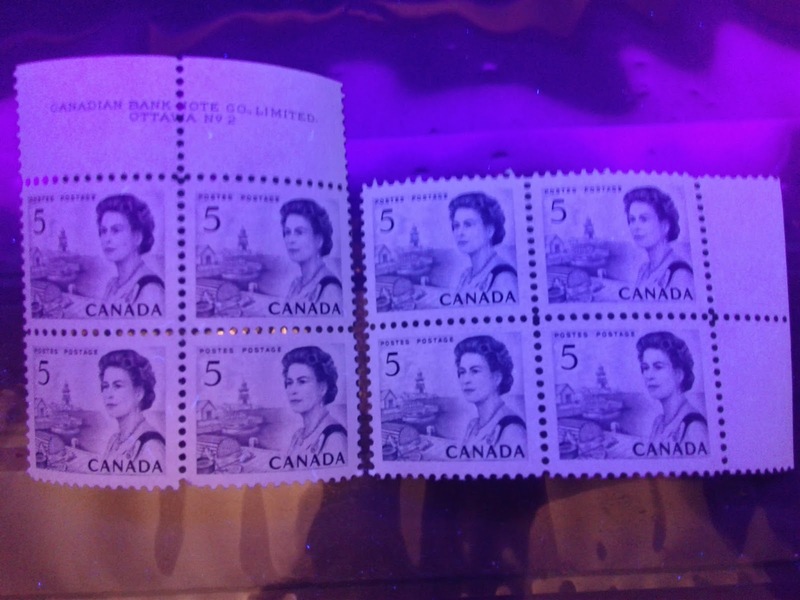 The next two stamps in the top row are greyish white under UV. The middle stamp contains very few low and medium fluorescent fibres, while the upper right stamp contains very few medium fluorescent fibres only. The bottom left stamp is also greyish white under UV, but contains 1-2 medium and high fluorescent fibres. 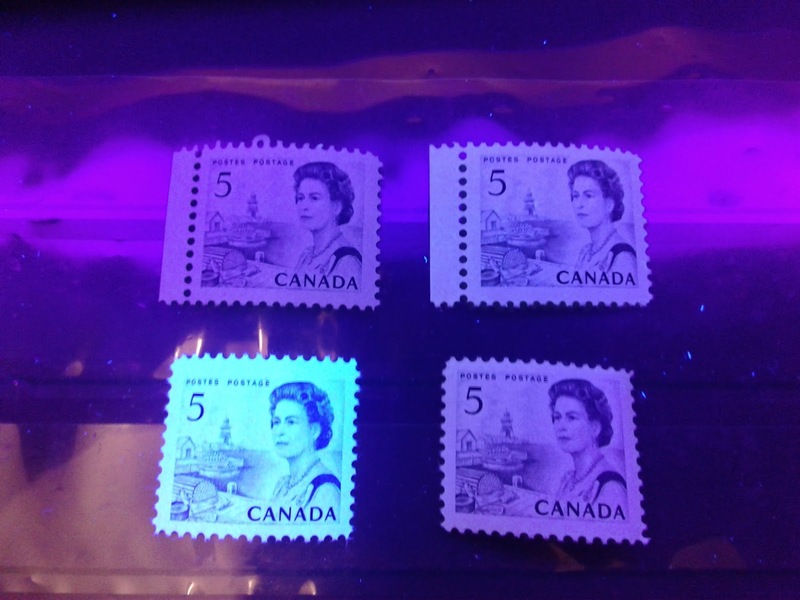 The bottom right stamp is grey under UV and contains 1-2 medium and high fluorescent fibres. 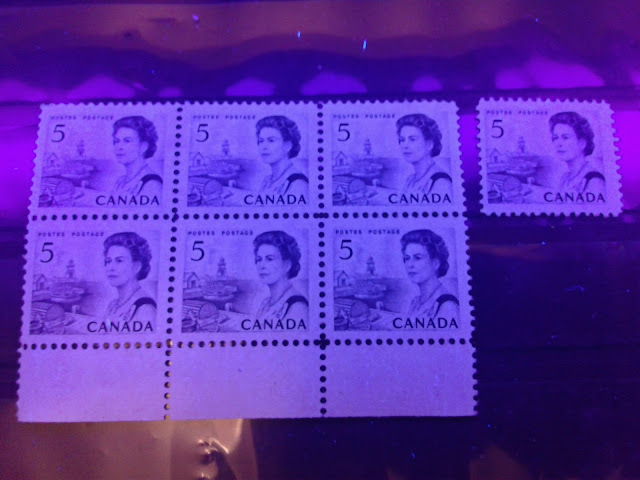 It is possible that the three greyish white stamps might be printed on the same paper, because the concentration and brightness of the fluorescent fibres contained in it can vary throughout the sheet. However, for the purposes of this study, I would treat these as separate paper types. I have found two different types of non-fluorescent paper on this stamp. One is a pure grey colour under UV light, while the other appears violet under UV. The key characteristic of NF paper, it that it will not appear whitish at all under UV, but will always be a shade of grey, brown, dark blue or violet. The paper of the block on the left is a ivory grey colour, like the dull fluorescent paper. 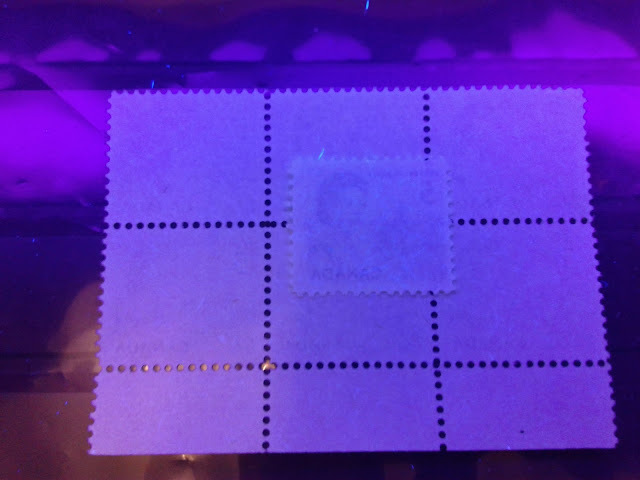 But the difference with this block, is that there is no whitish glow whatsoever, when it is viewed under UV light. So this is one variation of what Unitrade lists as non-fluorescent paper. 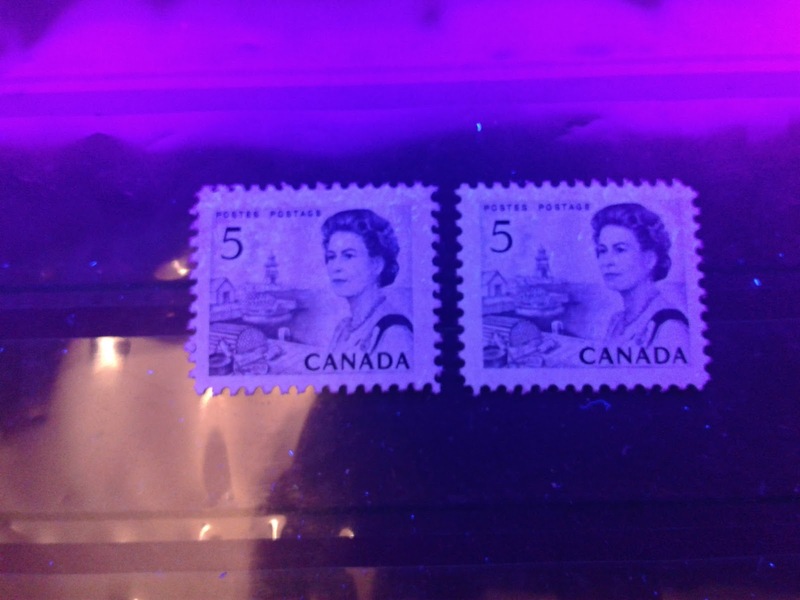 The stamp on the right is a non-fluorescent violet grey colour under UV. The paper of the block does contain 1 or 2 high fluorescent fibres on each stamp, while the stamp on the right does not contain any fluorescent fibres. I have found three varieties of paper that qualify as low fluorescent. It should be noted that while the low fluorescent papers all appear a brighter white under UV than the dull fluorescent paper, these papers do not appear especially bright when viewed on their own. As you can see from the picture, there is not a significant difference between the low fluorescent paper, which is shown on the right, and the brightest of the dull fluorescent papers (greyish white), which is shown on the left. If you look carefully, you should be able to see that the right stamp is slightly brighter than the one on the left, but it is not much brighter. In actual fact, if you compare the low fluorescent paper to most of the dull fluorescent papers, it is significantly brighter, and should be obvious when you are sorting a large quantity of stamps. 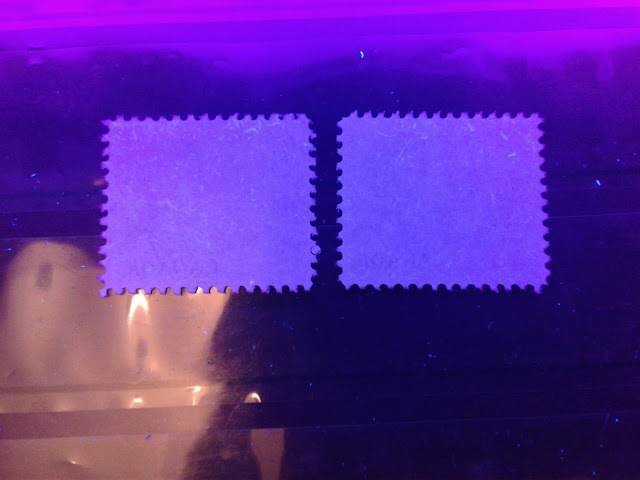 The pair on the left appears a low fluorescent blue grey colour under UV light, and the paper contains very few low fluorescent, medium fluorescent, high fluorescent and hibrite fibres. The upper right stamp is low fluorescent greyish white and contains a very sparse concentration of medium fluorescent fibres, and very few low fluorescent and high fluorescent fibres. 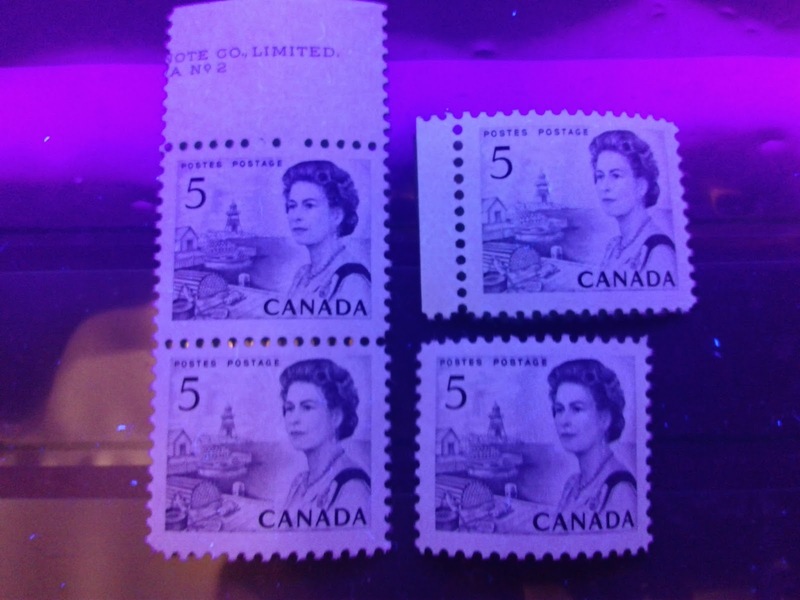 The stamp on the lower right is also low fluorescent blue grey under UV. This time though, it contains very few medium and high fluorescent fibres, which together, constitutes a very sparse concentration of fibres overall. Unitrade lists hibrite paper, but an examination of many copies of the stamp on the so called hibrite paper reveals differences in the brightness of this paper. I believe that there is actually a high fluorescent paper, as well as a medium fluorescent paper in addition to the true hibrite paper. This picture shows the true hibrite paper on the left, and the high fluorescent paper on the right. 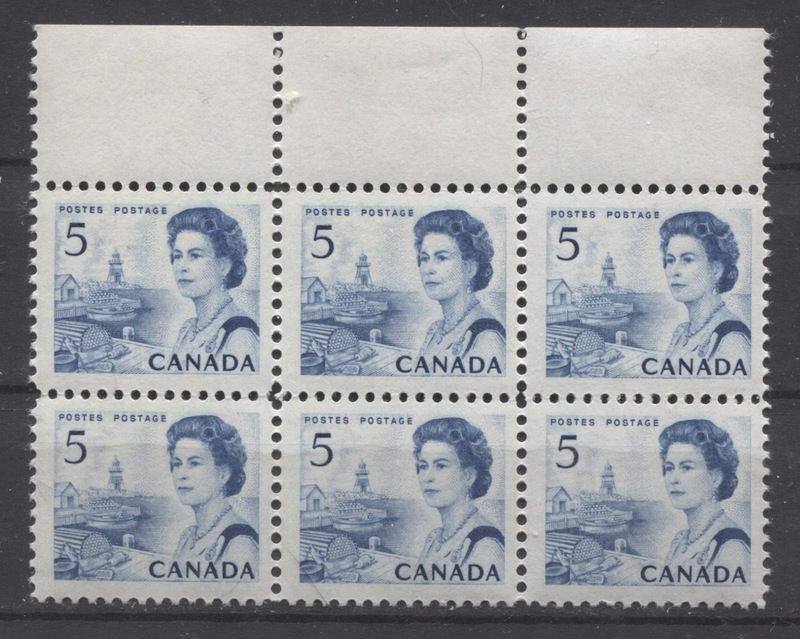 Although you may have to look at the comparative pictures for a while to clearly see the difference, it is very clear when you compare the two papers within a larger number of similar stamps. The above picture shows the hibrite paper on the left, and a much deeper paper on the right. This paper is much bluer than the bluish white of the hibrite paper. This is what I would call a medium fluorescent to medium-high fluorescent paper. 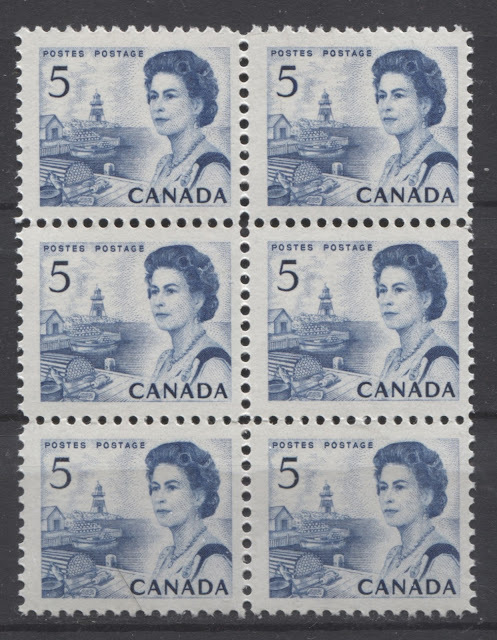 There are several different shades of the blue ink used to print these stamps. Some of these differences are quite obvious, while some are subtle. On the left we have the common deep blue shade, which is found on most stamps from the early printings. It is a near perfect match to the deep blue swatch on the Stanley Gibbons colour key. On the right is an example of the deep bright blue, which does not have a corresponding swatch on the Gibbons colour key, and is found on the later printings mostly. These are both variations of the deep blue above, but are ever so slightly different. 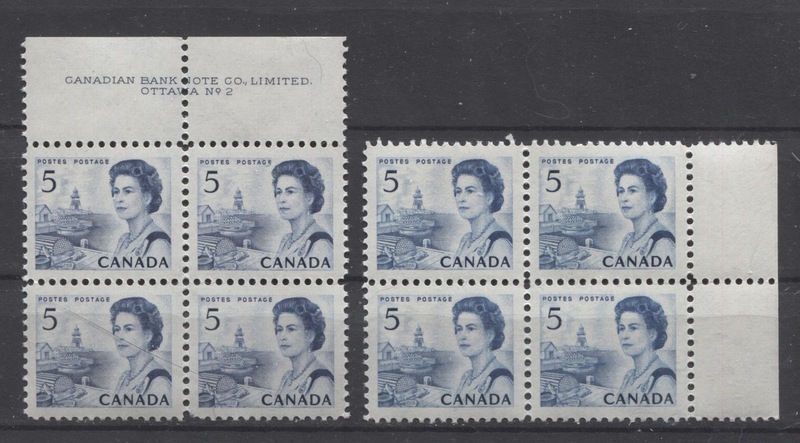 The left stamp is a little darker, containing a hint of black to the colour. It is actually very close to indigo on the Gibbons colour key. The stamp on the right is just a touch paler. The stamp on the left is slightly lighter than the one on the right. The stamp on the left is a pale indigo. The stamp on the right is a perfect match to Gibbons' indigo shade. This shade is very similar to the deep blue in terms of its tone, but is slightly brighter. It is not quite as bright as the deep bright blue however. This shade is a more vibrant version of Gibbons's blue shade. I would simply call it the deeper bright blue shade, to signify that it is not as deep as the deep bright blue shown previously. This shade is the closest match I have to the blue shade on the Gibbons colour key. It is just slightly deeper, but the same general tone. I have identified nine shades here. Although, some of these shades appear to be associated with certain printings, I would expect that the possibility that all of them can be found with most varieties of paper and gum is quite high. Under UV light the inks of all stamps except those on hibrite paper are non-transformative, given that they remain shades of deep blue under UV. The stamps on the so called hibrite paper appear to be printed in black ink under UV. Therefore I would classify the ink used on these printings as transformative in nature. Smooth, yellowish cream gum with a semi-gloss sheen. Smooth, cream gum with a satin sheen. Streaky yellowish cream gum with a semi-gloss sheen. Smooth, cream gum with a semi-gloss sheen. Smooth, cream gum with a satin sheen and a somewhat blotchy finish. I have only found this gum on the so-called hibrite paper. Smooth cream gum with an extremely glossy sheen. I have generally found gum types 1, 3 and 4 with all levels of paper fluorescence. Type 2, I have only seen on either dull or low fluorescent paper. 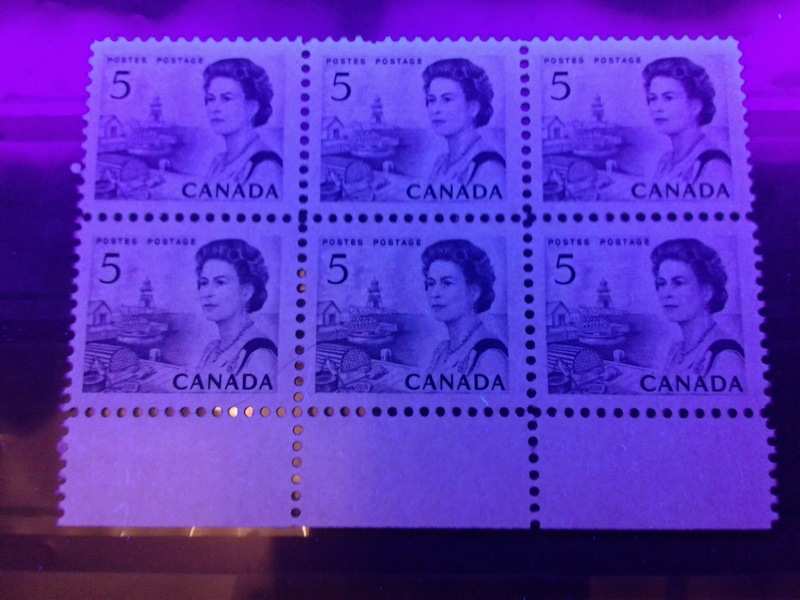 Type 6, I have only seen on the dull fluorescent paper. According to Unitrade, the hibrite paper did not appear until December 1971, after the 11.95 perforating machines were retired by the CBN. Therefore, it should only exist perf. 11.85 line. However, all the other printings should exist with four different line perforations: 11.85, 11.95, 11.85 x 11.95 and 11.95 x 11.85. Unitrade lists a variety called the"line in 5". It is too difficult to see even on a 1200dpi scan, so I will not be able to illustrate it here. Basically it is a slightly oblique, very fine line that joins the top bar of the "5" to the semi-circular curve of the "5". It occurs on plate 3, position 11 of affected panes. According to a leading specialist in this issue, there is also another, similar flaw on the "5", except this time the line joins the top of the semi-circular curve to the bottom of that curve. Unitrade lists the precancels on either dull fluorescent or hibrite paper. I would expect that the same range of fluorescence levels found on these papers should exist with precancels. My stock of precancels is fairly limited, so I cannot check this for certain. 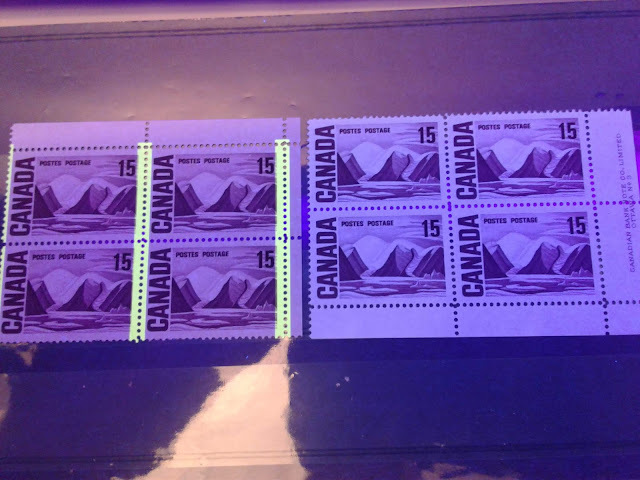 However, I can say that I have not found any examples of precancelled dextrose gum stamps on either the low fluorescent, or the non-fluorescent papers. So in this regard, Unitrade's listings would appear to be correct. Dull fluorescent papers: 10 x 5 x 4 x 2 x 9 = 3600 stamps. Non-fluorescent papers: 2 x 3 x 4 x 9 = 216 stamps. Low fluorescent papers: 3 x 4 x 4 x 9 = 432 stamps. Hibrite papers: 3 x 4 x 2 x 9 = 216 stamps. Dull fluorescent paper: 3600 x 4 x 4 = 57,600 plate blocks and 172,800 blank corner blocks. Non-fluorescent paper: 216 x 2 x 4 = 1,728 plate blocks and 5,184 blank corner blocks. Low fluorescent paper: 432 x 4 x 4 = 6,912 plate blocks and 20,736 blank corner blocks. Hibrite paper: 216 x 12 = 2,592 blank corner blocks. The actual number of collectible variations is likely much lower, as there will be shades that do not exist with particular paper and gum types and so forth. However, a very fun project for a very focused philatelist is to see how many do in fact exist. According to Unitrade the PVA gum stamps for this value first appeared in December 1971, though an exact date is not given. This is the same month as the 1c stamps with PVA gum and is 3-4 months earlier than for the other low values that exist thus. A very white paper that appears white even against a stark white background. This paper has a smooth, coated appearance on the face, and shows no mesh pattern when held up to strong back-lighting. A whiter paper that nonetheless appears cream coloured when viewed against a stark white background. The printing surface again appears smooth and coated. When you hold this paper up to a strong back-light, there are clear vertical striations visible in the paper. Both of these types appear to be associated with specific paper fluorescence levels. 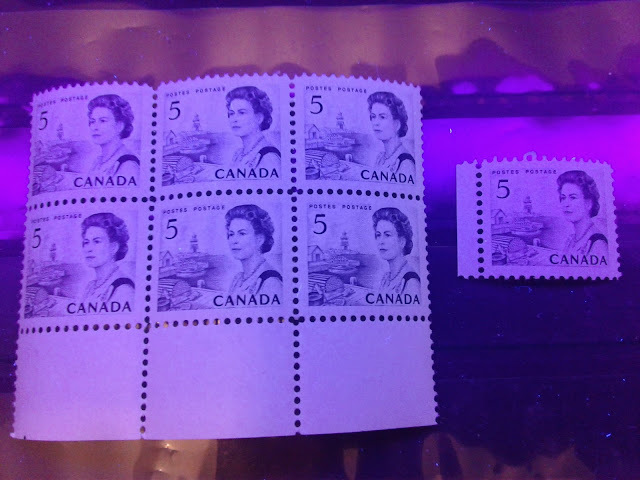 Therefore the number of different papers on which these stamps can be collected is determined by the paper fluorescence, and not the above characteristics. However, it is important to be aware of these attributes of the paper also. Unitrade lists the paper of the PVA gum stamps as being either low fluorescent flecked, or low fluorescent without fibres. What is confusing to beginning collectors is that the basic colour of the paper under UV light often appears the same as many examples of the dull fluorescent and non-fluorescent papers. 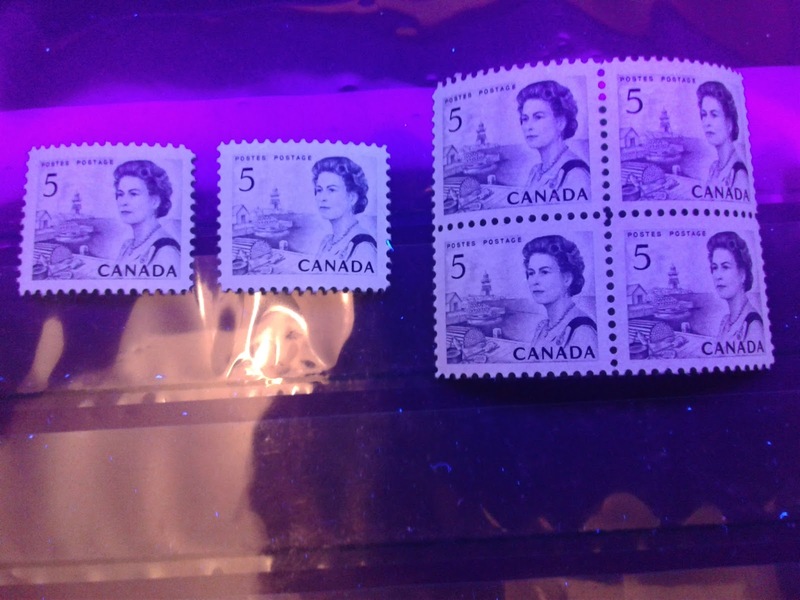 What makes these papers different is the inclusion of a much larger number of fluorescent fibres than the stamps with dextrose gum. The paper also often contains brownish woodpulp fibres that can only be seen under UV light. I call them woodpulp fibres, as they appear brownish under UV. I have found 8 different types of low fluorescent paper containing various concentrations of fluorescent fibres, and in some cases, brownish woodpulp fibres, and one type of low fluorescent paper that does not contain fluorescent fibres. 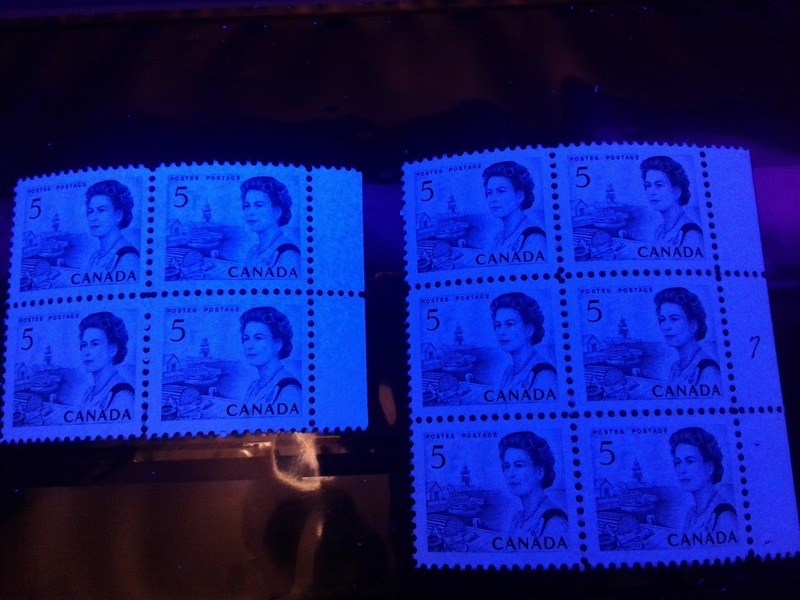 Both the block, and the stamp appear low fluorescent bluish grey under the UV light. The main difference between the two papers lies in the number of visible fluorescent fibres in the paper. The block shows a sparse concentration of low fluorescent fibres, and a very sparse concentration of medium fluorescent fibres, high fluorescent fibres and brownish woodpulp fibres on the front. The stamp on the right does not contain any woodpulp fibres, but does contain a sparse concentration of low, medium and high fluorescent fibres. On the back, these papers appear more different than they do on the face. To highlight the difference better, I have placed the stamp on top of the block. The block appears greyish on the back, with a sparse concentration of low fluorescent fibres, very sparse concentrations of medium fluorescent fibres and brownish woodpulp fibres, and very few high fluorescent fibres, visible in the paper. The stamp on the other hand appears bluish grey, with sparse concentrations of low fluorescent fibres and medium fluorescent fibres, and a very sparse concentration of high fluorescent fibres, visible in the paper. Both these papers appear low fluorescent in their own right, but the inclusion of the fluorescent fibres strengthens the overall fluorescence level, without raising it to medium fluorescent. 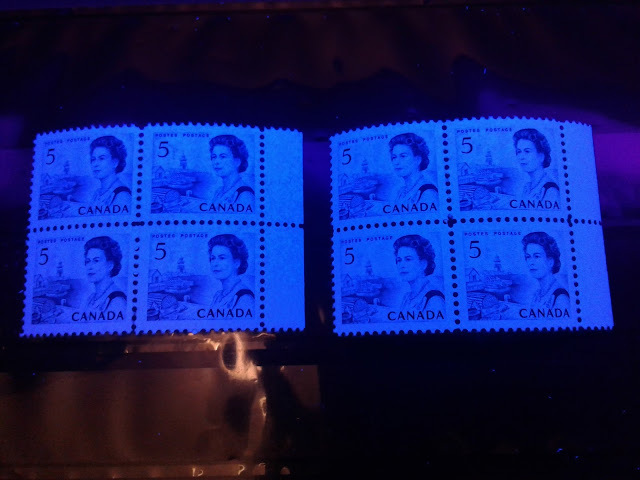 The stamp on the left appears deep grey blue under UV, and without the fluorescent fibres contained in the paper, it would likely be classified as non fluorescent. The paper however contains a low density concentration of low fluorescent fibres, sparse concentrations of medium and high fluorescent fibres and a very sparse concentration of hibrite fibres. Together, these fibres raise the overall perceived fluorescence level of the paper from non-fluorescent to low fluorescent. The stamp on the right appears a dull fluorescent bluish grey, but contains a sparse concentration of low, medium and high fluorescent fibres in the paper. On the back, the papers appear the same as they do on the front. The bright spots in the picture are the brighter fluorescent fibres contained in the paper. If you look closely, you can see that the stamp on the left has more fluorescent fibres in the paper than the stamp on the right. This block appears low fluorescent bluish white under UV light, and contains a sparse concentration of low fluorescent fibres, a very sparse concentration of medium fluorescent fibres, very few high fluorescent fibres and very few brownish woodpulp fibres. The paper appears the same on the front, as it does on the back. The stamp on the bottom is a low fluorescent cream colour and for all intents and purposes contains no fluorescent fibres - at least not compared to all the other papers we have examined so far for the stamps with PVA gum. If you look closely with a loupe on the back, you will see a very sparse concentration of low fluorescent fibres only. But if you view it under UV without a loupe, it looks as though there are no fluorescent fibres. I believe that this is the paper that Unitrade lists as the LF PVA. The first two stamps on the top row appear dull fluorescent blue grey, while the stamp on the top right appears grey. 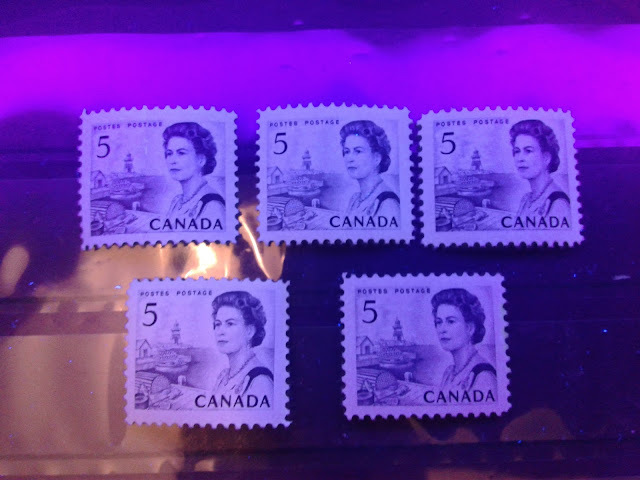 The upper left stamp contains a sparse concentration of low fluorescent fibres, a very sparse concentration of medium fluorescent fibres and very few high fluorescent ones. The middle stamp contains a sparse concentration of medium fluorescent fibres, and very sparse concentrations of low and high fluorescent fibres. The grey stamp at the top right contains a sparse concentration of low fluorescent fibres, a very sparse concentration of medium fluorescent fibres and very few brownish woodpulp fibres. So while these papers are all very similar, they are all different in ways that can be methodically described. Both shades are very similar, with the one of the left being slightly brighter than the one on the right. The stamp on the left is a slightly brighter version of Gibbons' deep blue, while the one on the right is a near perfect match to Gibbons's deep blue. A very thin, white, smooth PVA gum with an eggshell sheen. This seems to be found both paper types. A thicker, creamy PVA gum with a satin sheen. This gum seems to be found only on the striated paper. According to Unitrade, these stamps first appeared in December 1971. Accordingly, they should only exist line perf. 11.85, as the machines gauging 11.95 had been retired fully by 1971. 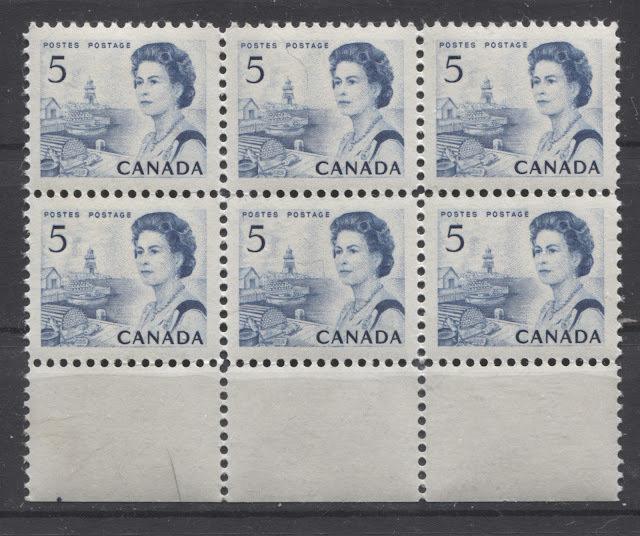 There are no reported major plate flaws on the PVA gum printings, as all come from plate 5, and the only reported flaws involving the "5" come from plate 3. Unitrade does list the PVA gum stamps on low fluorescent paper as existing with a precancel. This is listed as #458xxii. The listing would appear to suggest that only the low fluorescent paper without fluorescent fibres exists so precancelled. I do not have many singles at all of the PVA gum precancels to study, so that drawing definitive conclusions about what exists is difficult. 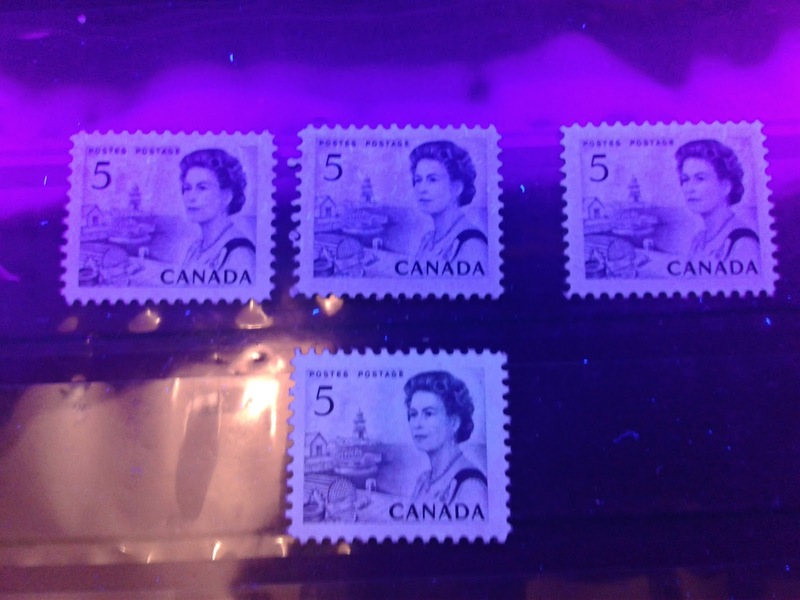 However, all the stamps that I did examine were printed on the striated, cream paper, which gave a low fluorescent greyish white reaction under UV, with a very sparse concentration of low fluorescent fibres in the paper. The gum is the thicker, satin PVA gum. The shade was a near perfect match to Gibbons's deep blue. Stamps: 9 x 2 x 2 x 2 = 72 stamps. Plate blocks: 72 x 4 = 288 plate blocks. Corner blocks: 72 x 12 = 864 blocks. So, much less scope here than with the dextrose gum printings, but still much, much more than the listings in Unitrade would suggest. This brings me to the end of this week's post, and my discussion of the untagged sheet stamps of the 5c Atlantic fishing village stamp. Next week, I will look at the tagged sheet stamps. 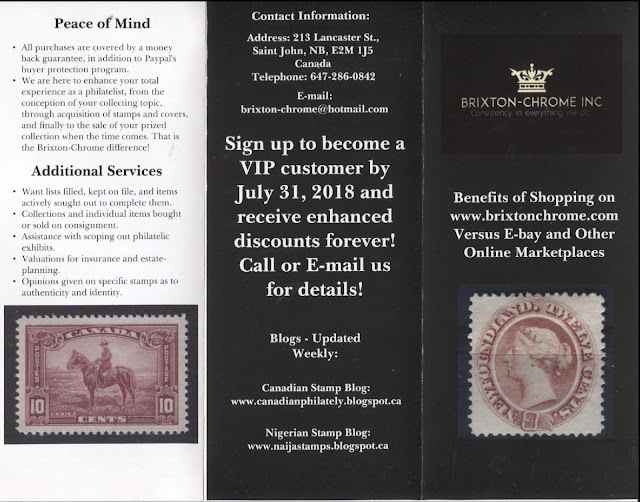 If you become a registered customer before July 31, 2018, you will receive an extra 5% discount, over and above the discounts of 5%-20% that I normally offer, FOREVER, as long as you are a customer of Brixton-Chrome. This means that you will always receive at least a 5% discount on every order and you can save as much as 25% on orders over $100 USD. Be sure to message me with your information if you want to register. It is that simple. 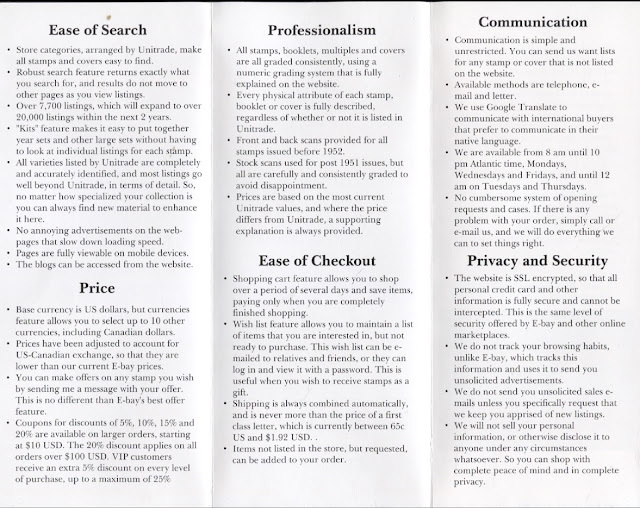 Below is a copy of my information brochure about the advantages of shopping on the new website, as compared to E-bay and other online marketplaces. Click on the image if you wish to enlarge it.